Seagulls are familiar birds on Arran and with knowledge of leg colour and wing colour it is relatively straightforward to distinguish between the six adult species of gulls regularly seen on Arran namely: Great Black-backed Gull, Lesser Black-backed Gull, Herring Gull, Common Gull, Black-headed Gull and Kittiwake. The first three are larger and all have black wing tips even in juvenile plumage. Bearing this in mind, it is worth checking at this time of year, particularly after storms, any gathering of large gulls, looking for larger gulls that do not have black wing tips. 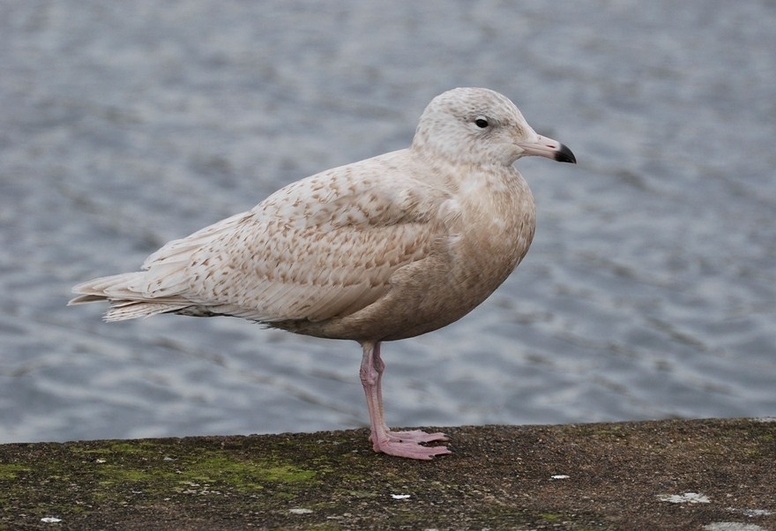 If you do come across these wintering white-winged gulls there are liable to be one of two species - Glaucous Gull or Iceland Gull. Both these species breed in the Arctic region. The Glaucous is more widespread while the Iceland is restricted to Canada and Greenland, not Iceland! In the winter some wander south. In the five years of the bird atlas there were three Iceland records and two Glaucous records on Arran. The last Iceland record was in 2014 and the last Glaucous in 2012. They are uncommon but worth looking out for. 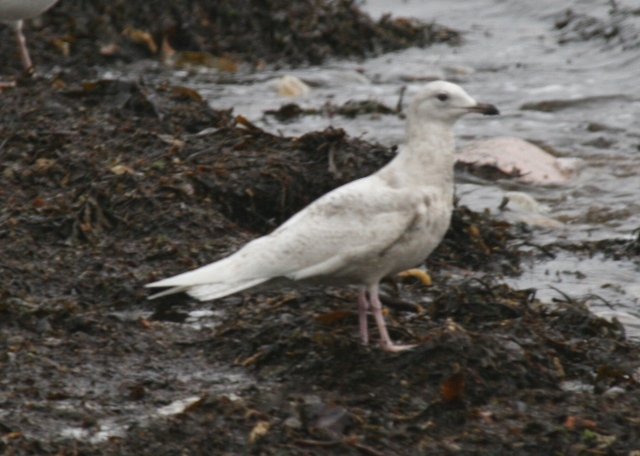 Once you have found a large white-winged gull how can you tell if it is a Glaucous or an Iceland? With the bird standing at rest, concentrate on the rear end of the bird,in particular the length of the folded wings in relation to the body. Iceland Gull has long, tapered wings that project well beyond the tail, producing an attenuated look to the rear end. In contrast the larger Glaucous Gull has relatively short wings that are proportionately similar in length to the body giving a blunt look to the rear end.